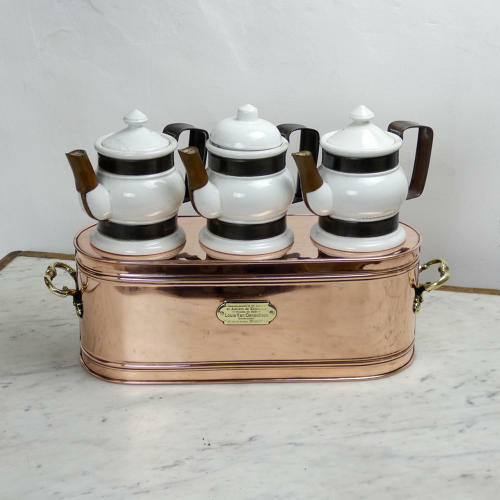 A really unusual copper bain marie for keeping drinks warm. This would have been used on a buffetiere, probably for keeping coffee, tea or chocolate warm. It could have been used for any combination, in either a private home or a restaurant. The base, or bain marie section is made from copper and has an interesting brass makers plaque on the front. This reads ‘Chaudronnerie de Cuivre et Ateliers de Mechanique -Fondes en 1818 - Louis Van Genechten Constructeur 19 rue de Laeken Bruxelles’ . So this was made by a Belgian company who made copper boilers and had a mechanical workshop. I cannot find anything in the way of records for this company but, going by the construction, it would date from c.1900. The bain marie is made from a substantial gauge of copper, it has folded seams and ornate brass handles to either end. Into this sit three ceramic pots for the liquids. These are made from a heavy white earthenware. They have copper banding and handles, which are original, but each one also has a copper end to the spout. These have been added later to cover damage as there is chipping to the ceramic spout ends. The copper on the pots has not been polished as it has acquired good patination over the years. Two of the pots have chips on the bases, one has chips and a crack to the lid and another has a replacement lid. Due to the condition it is unlikely that this would now be used but it is an extremely decorative item. Price includes postage within the U.K. Shipping to the U.S.A. add £45. Western Europe add £10.